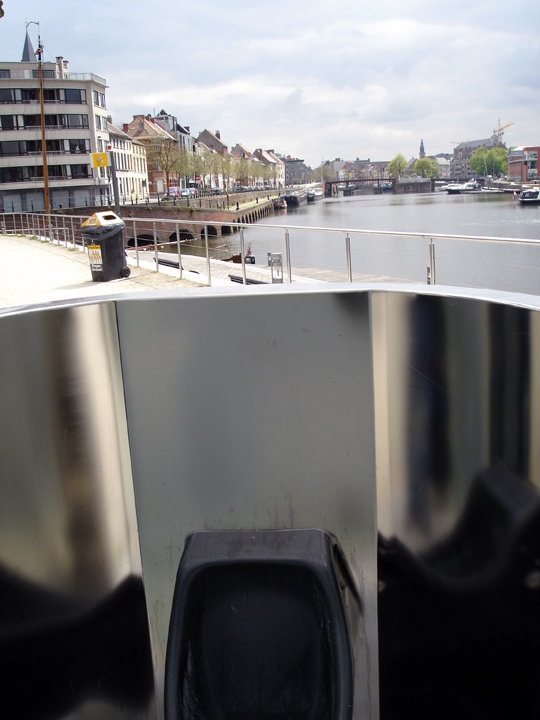 This picture shows the view that a person gets to enjoy while peeing in one of Ghent, Belgium’s public urinals. In 2010 I stopped teaching yoga and in 2011 I ended my career as a locksmith. In 2010 I began working behind the scenes making and editing adult fetish movies. I realized that what interested me most about my locksmithing research and yoga teaching was that both examinations explicated the ways that each of us create (or are forced to create) very private moments in very public ways, and the power exchange that authorities and teachers have with their students or peers. So, I began an investigation into how we share public space and maintain our privacy outside the confines of our own homes. And, also the different ways that power can fluidly exchange power between people in conscious/unconscious or willing/unwilling ways. For lack of a better name, I am calling this series “Contractor”. The pieces that follow are my first attempts to engage those ideas.